Video content is an increasingly important part of internet marketing. It can however take a lot of time and effort to create – Link2Vid claims to be able to help you with this challenge. But is Link2Vid a scam, or is it really a great and easy way to create videos and generate free targeted traffic? Let me reveal right away that I have a lot of reservations, when it comes to this software and approach. This does not mean it cannot work, but there are some things you NEED to know and consider before getting it. This Link2Vid review will give you an inside look and understanding of how the tool really works, and why it might NOT be a good long-term solution. Link2Vid can be a fast way to create video content. BUT the videos you can create with this software are of poor quality, and automated content is in general rarely a good solution. It will make it hard to rank, to connect with your audience, and to earn. Therefore it is NOT a tool I recommend unless you have specific reasons to just want fast videos and not worry too much about the quality. What is Link2Vid and what does it offer? Link2Vid is a software and system developed by Mark Bishop. It is a software he says he has used himself to create great videos and drive free targeted traffic since 2015. There is no doubt that creating videos that rank on YouTube and Google is a great way to generate traffic and income. And video is becoming more and more important to use in internet marketing. The challenge for many is however the time and effort it can take to create videos, and many feel like they might not have the skills to create a video. Therefore, the idea behind Link2Vid and what it does is great – as I will show you later, I however have a lot of concerns about the approach, but let’s for now focus on what Link2Vid offers you. What it does it to help you transform any keyword or content into a video automatically. As Link2Vid itself explains it, it just takes 4 steps to create a video using the software. You need to take 4 steps to create videos with Link2Vid. Step 1 is to choose a keyword you would like a video about, or choose a blog post or article you want to convert into a video. Link2Vid will then either use articles and content from its database, if you choose a keyword, or extract relevant content form the link/article you want to convert. This will then automatically be turned into a video. Step 2 is an optional step. You can edit the video, if you want to. If you decide to get Link2Vid, I would suggest to definitely use this feature, as you should not solely rely on a system to create a video. You need to go over it and make adjustments. Step 3 is to SEO your video from within Link2Vid’s dashboard. This is supposedly going to be very easy and help you rank fast with just a couple of clicks. Step 4 is then to post the video and start getting traffic from it. The whole process is in theory definitely a great idea. Posting videos on for example YouTube can generate a lot of relevant traffic and thereby earnings. So it understandable that someone has tried to create a software that can automize this process and make it very easy and fast. But does it actually work? Let’s look into that now. One thing is that the process and steps in theory is a great way to generate traffic and thereby increase your chances of earning online. But it is important to understand and consider exactly what Link2Vid really offers, and how internet and video marketing in general works, before investing in this software. There are different aspects to look at to see if Link2Vid really can help you get results. I will go over the 3 most important aspects below. The first thing that is important to know is if the Link2Vid software can even do what it says – meaning easily create video content. The good news here is that you can actually create videos by using a keyword or link. The software can actually help you create videos fast. However, if you decide to go for this option, I would suggest to always make sure to use the edit option and go through your videos and do adjustments and make sure everything looks and sounds fine. Even though the Link2Vid tool can create videos fast, and you will get some video training about how to use it, there are in my opinion however some big problems with this way of creating video content, as I will explain below. One thing is to be able to create videos fast. That is of course nice, but too often today we focus so much on how fast we can do things, and how fast we can earn online that we forget the quality. How much you will earn online is very closely related to the quality, and if you want to build a long-term successful online business, it is important you provide quality for the people watching your videos or read your content. This is where automated content in most cases really cannot deliver. I have for example previously made a review of WP Auto Content that generates automatid content for your website, and Link2Vid can create automatic videos. The problem with tools like this is often the same – the quality will be low, and it will make it hard for you to build long-term relationships with your followers, as they do not want to spend time watching or reading poor automated content. This is a video that is telling people about psoriasis. The info is fine, but to be honest – how long would you watch a video like this? It is extremely boring, and it is clear that the content is being read by a robot, and it sounds very unnatural. You will get a very hard time connecting with people with content like this. After having seen several examples of videos created with Link2Vid it is for sure not a software I want to use for my own content. It might help you get a few sales and earn some commissions through affiliate marketing, which is one of the things Link2Vid claims to be able to help you do. But it will NOT create a lot of fans and followers, as people connect more to real people sharing real info instead of automatic created content. And it will also make it hard to rank in Google and YouTube, even though Link2Vid claims their tool is amazing at this. To get a lot of long-term free traffic with videos or content in general, you need to rank in Google and YouTube. This takes time and effort, and let me reveal right away that there is no quick fix for this. Link2Vid claims their software has given great results since 2015, and shows several examples of this. I have however spotted some inconsistencies, and also combined it with my own experience and knowledge of online marketing. This is my findings and my opinion. 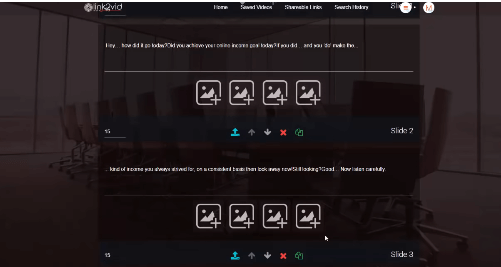 This does not mean Link2Vid cannot work for you, but I want to show you these aspects, so you have as much knowledge as possible before making any decisions about investing in this tool or not. 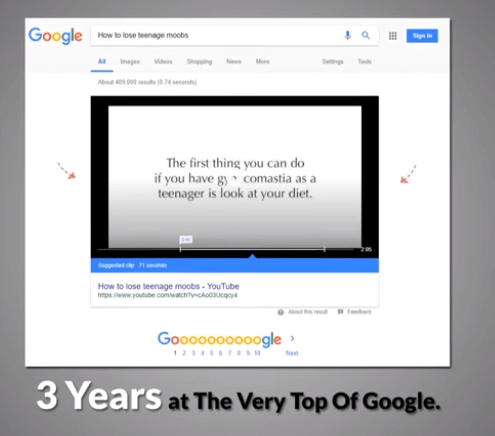 One of the big examples Link2Vid gives is a video called “How to lose teenage moobs”, and you are told this has ranked at the top of Google for more than 3 years and has more than 10,000 views. Link2Vid shows this example of a video ranking in Google – not so impressive when you look closer. There are several problems with this claim. First of all – the video has not had more than 10,000 views. At the time of creating this review, the video had 8591 views, and that was even a while after the sales video of Link2Vid was created where it says more than 10,000 views. To their defense I must say that the video does actually rank at the top of Google for the keyword they say. However, this does not really prove much. It does not mean anything to rank at the top of Google, if you rank for a keyword that does not have any search volume. And that is exactly the case for this video. I used my favorite keyword tool Jaaxy to check this. It clearly shows that the keyword the video is ranking for does not have any monthly volume. The keyword the Link2Vid video is ranking for does not have any volume. As you can see on the image above, it shows that it is a keyword with less than 10 monthly searches, so really not a great and impressive thing to be able to rank at the top of Google for this. You can of course argue that it does not matter, as it seems to be working since it has more than 8,000 views. But when it comes to YouTube videos, it can be tricky to only look at views. It is impossible to see where those views come from. It is easy and cheap to get this kind of views, if you want to just make it look like you have had many views. I am not saying this is what Link2Vid has done, but just saying to be careful about only looking at the amount of views, as this can be manipulated. Personally, I do not use tricks like that to make it look like I have more views. I have many videos that have very few views, but I have a long-term strategy working with them, and know it takes time and effort to get quality views. And also here quality is what really matters and not only quantity, and I encourage you to focus on this when building an online income. So the proof Link2Vid is using is not really good proof, and you need to know that if you want to rank in either Google or YouTube, there is no easy short-cut. It will take time and effort, and you need to consider your long-term goals and what kind of quality you want to create for your followers before starting to use any fully automated system. As you can see, I am very skeptical about the advantages of using Link2Vid and similar automatic content tools. But if you still want to get it, you need to know a few things about the pricing. The regular price of Link2Vid is $37 – sometimes it has discounts. If you try to leave the page, you will also be offered a lite version of the software for a discounted price. If you get to the page while it has a discount, you can see a counter that all the time counts down and says the price will go up when it hits zero. Do not let the counter stress you out. This is just a sales trick to get you to buy right away. The price will not change once the counter hits zero – the counter will just start over again:-) So do not let the counter stress you out, and push you into making a quick decision. The price for getting Link2Vid is in general not very high, BUT you have to be aware that there are upsells after you get access. So it can end up costing you quite a bit more to get full access to everything Link2Vid offers. It is important to mention that you do not need to buy these upgrades, as you do in some other systems. You can still use Link2Vid without getting them. Be aware that if you buy Link2Vid, you will at the same time sign up for several newsletters – this is mentioned in the small disclaimer at the bottom of the page. The disclaimer shows you will sign up for several newsletters, if you buy Link2Vid. Here you can see that you will automatically sign up for newsletters from Mark Bishop, Venkata Ramana & Radu Hahaianu and their companies IKKONIK LTD, Innovativez digital group & Bravinn Technologies. This is quite a lot of newsletters. It might not be an issue for you, but just something you have to know, so it does not come as a surprise. No matter what, you do however have to consider, if it is the right way to create content, if you want to build a long-term sustainable income online, or if you want to create something personal and of higher quality. Link2Vid is not a scam. You do get access to a software that can create automatic video content. I however do not think this is a good solution. But let’s sum up the pros and cons, so you can get a better overview before deciding, if it is for you or not. If you just need some fast videos, and do not mind too much about the quality and about creating something that is unique and can really help your followers, then Link2Vid is definitely a fast way to create these small videos. I would however not recommend this approach, as quality in my opinion is one of the most important aspect when creating a long-term sustainable income online. People do not connect with automatic generated content, it does not rank well, and you can end up wasting a lot of time creating poor quality instead of putting in some extra work to create something that is truly valuable for your viewers/readers (and for your income). For these reasons Link2Vid is NOT a system I recommend, even though it does create fast videos. I would instead suggest taking your time to learn proper internet marketing focused on high quality, and on how you can make a difference for your readers/viewers. Both Google, YouTube, and people will love this, and in the long run this is what will generate a sustainable income for you. If you have any comments, questions, or have any experiences with Link2Vid yourself, I would love to hear from you in a comment below.